This inspirational book from ABC News correspondent Mara Schiavocampo takes you on her journey of weight loss—and helps you shed pounds and find peace, health, and happiness in the process. Like so many people, Mara Schiavocampo had struggled with weight for most of her life. She tried every diet on the planet, suffered a debilitating eating disorder, joined a bizarre food cult, took dangerous pills, worked out for insane amounts of time—and still tipped the scales at nearly 230 pounds. But more than reaching a healthy weight, Mara wanted peace and freedom from the constant mental torment brought on by food. A healthy and effortless way of life. For the rest of her life. And that’s what she did. While juggling a marriage, new baby, and a budding television career as a correspondent on NBC, Mara “accidentally” stumbled onto a formula that worked for her. She lost ninety pounds in two years and is now stronger and fitter—and, most importantly, happier—than ever. The most surprising part her new lifestyle? “It’s not a chore, it’s a pleasure,” she says. 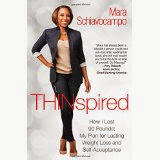 In Thinspired, Mara shares her weight-loss secrets and the formula for her success plan. Instead of focusing strictly on “Do’s” and “Don’ts” she talks about eliminating the foods that have control over you—whether that’s wine, flour products, dairy, or sugar. By following in Mara’s footsteps, you’ll lose the pounds and gain back your energy, control, health, and happiness.